EMILY's List, the political action committee that serves as a resource to help elect pro-choice Democratic female politicians to office, held a "Madam President" town hall discussion Friday. The topic of the meeting was, unsurprisingly, the election of the United States' first woman president. The panel featured Senator Claire McCaskill (D-MO), EMILY's List President Stephanie Schriock, candidate for U.S. Congress Staci Appel (IA-03), and political operative Jessica VandenBerg, who discussed the challenges and necessity of having more women in political office. Before the town hall began, the hashtag #mpotus began trending on Twitter. The room also reached full capacity quickly. "Let’s be clear, this is just the beginning of our ambition," moderator O. Kay Henderson, Radio Iowa New Director, opened. "We want our daughters to aspire not to be America's first woman president, but to be the fifth or the tenth woman president. That day is going to come sooner than you think. And let the record show that the journey begins here, today, in Iowa." Here are some of the highlights from the rest of the discussion. McCaskill reiterated her endorsement of Hillary Clinton's potential bid for president — and said that if Clinton doesn't end up throwing her hat in the ring, she won't consider a run herself. "We have to have millions of people engaged and ready for what will be a pivotal race in America's history," said the senator. "And that is about getting everyone excited now. About what I hope will be that moment in 2017 when we get to say 'Madam President' to Hillary Rodham Clinton." Answering a question on whether she would consider running for president in the next election, McCaskill underlined the importance of being a Democratic representative for a traditionally red state. "I feel a particular obligation to stay in this office and do the very best for the values that we hold dear," she said. EMILY's List President Stephanie Schriock put forward a strategy for gender equality in politics. Schriock emphasized the importance of having women in non-presidential offices across the country as well. "Right now there is only one other Democratic woman governor in the country, Maggie Hassan," she said, "And we have to change that." "Last cycle, we trained over 1,300 women around the country to run for state and local office," Schriock added. 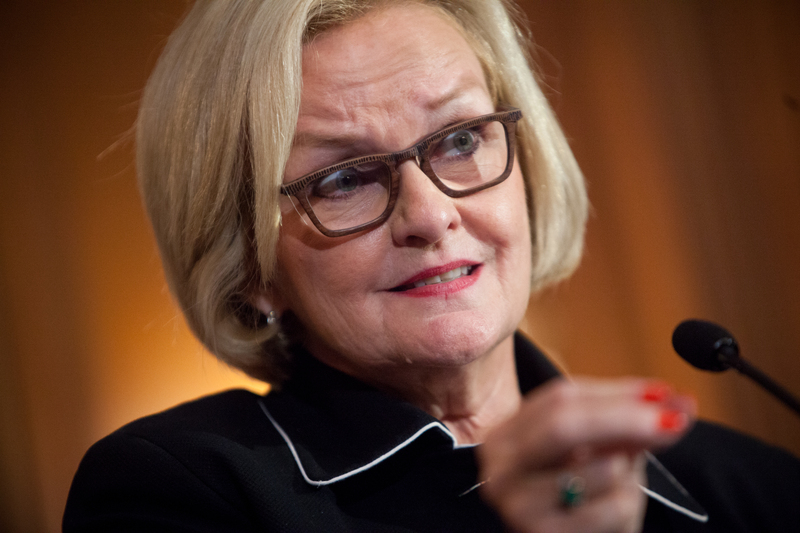 McCaskill addressed gender differences between male and female politicians. "There is a choice between combat and compromise. And I think women do naturally gravitate towards compromise," she said. She also remarked on the fervent abortion debate, saying, "You do not reduce the rate of abortion by reducing access to birth control. And the women got that." Men want a woman president, too. The first audience question for the panel came from a man who began by saying, "I think I speak for the whole room when I say we need more women to be leaders." McCaskill gave a shout out to her parents, and it was both funny and moving. "I certainly think both my mother and my father gave me permission to be bossy and opinionated," she said. "My dad reassured me that even though no one wanted to date me in college, it would get better. And my mother was a masterful politician in every good sense of that word. She was that kind of flamboyant, she grabbed life by the jugular and took it. And I am no question sitting here because of her." After McCaskill talked about her mom and dad, Henderson asked a question about how hard it is to convince women without role models to run. "I don't think there's a woman in this country who doesn't have a role model now," Schriock responded simply. And then there's political analyst Zerlina Maxwell, who summed it up perfectly.